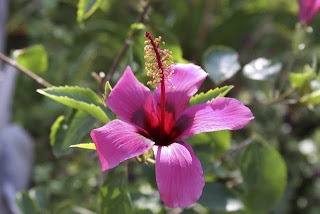 Although ‘Fiji Island’ is currently regarded as an early Hibiscus rosa-sinensis hybrid, it is considered by some to be a "species type" or "near-species type". Unfortunately, due to a dearth of historical information, we know very little about the origin of this stunning Hibiscus, but it is generally presumed that it originated in Fiji or thereabouts. In recent correspondence (2010) with Geoff Harvey of Queensland Australia, Geoff writes: "It may not actually be a hybrid, but rather a species or form, along with 'White Wings', 'Fijian White', 'Fijian Pink', and 'Ruby Rose', found only in Fiji. None of these Hibiscus acquired a botanical description to establish them as official species". Whatever the case may be, the appearance of ‘Fiji Island’ is quite different from other rosa-sinensis hybrids. The leaves have finely serrated margins and the flower itself is stunning. Fiji Island has 12cm, single, propeller-shaped blooms with dark pink petals, a darker center, and a prominent staminal column. This beautiful Hibiscus reportedly grows to 3m high, however it has a weeping, spreading habit which means a 3m width is more likely. A prolific bloomer and fast growing. One of my favorites!